Whew! That name for this post alone almost gave me carpal tunnel! I'm having a lot harder time with these Pick of the Month blogs than I originally thought. I thought they'd be a good way to keep me writing at least every month, but I'm finding them the hardest. It's all due to the fact that I only collect about six titles a month and rarely branch out. That is unless you count the free digital comics from Marvel.com. I picked this one for a few reasons. First, it was my birthday last month and I had a hard time deciding on what I wanted. Brooke repeatedly asked me and all I could come up with was the Green Lantern hoodie they had at Outland Comics. It wasn't until a couple days before my b-day we were walking through Hastings and found this little gem. I had to have it! Second, it's probably the only comics of note other than what I usually collect. Finally, it's nostalgic. I remember as a kid renting the 80's turtles from the local video store. You know the ones. It was filled with about three or four episodes of cheesy Saturday morning cartoon goodness. Also I was a huge fan of the original Turtles movie and wanted to see how this compared. It was great to see where the Turtles originated from. The stories are usually one or two issue shots. Complete with the first run in with the Shredder and how they first met April. Which coincidentally had nothing to do with the other as the movie had you believe. Which was okay by me. 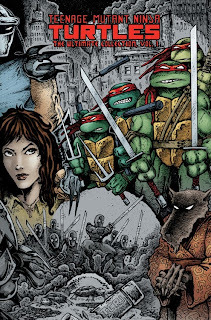 I think the biggest highlight was the Raphael one-shot that was in it. Why was this a big highlight? It was only the first appearance of my favorite Turtles character! Casey Jones. You know him. He carried wore the hockey mask and carried the sports equipment. It wasn't until I read this did I realize what a nut case Casey was. Doesn't mean I loved him any less. I kinda like those type of characters. You could really tell that Eastman and Laird (the creators) weren't professional writers. The stories really aren't good for anything more than the one-shots they were. The art was good, but nothing to put them at the top of my list. Like I said I think the biggest selling point and the reason I pick it this month is for nostalgia purposes. Any one growing up at my age remembers the turtles and how great they were. This is a little more adult than those cartoons (The turtles actually use their swords to kill!) but it's a good read none the less.